There’s really only one rule for this challenge: I have to take and post a photo every day, any time between midnight and midnight, to my IG account. No themes or anything, and no saving up photos. Simple! But because I couldn’t not overthink things, if I posted more than one photo in a day only one of them was the official daily pic, numbered and labeled with the #dailypic hashtag. All the others were just… y’know… extra. All they got was a caption. Over the next year and a bit I changed the numbering and hashtagging to make it (a) simpler, (b) more consistent (all my photos are equally special! ), and (c) make it clear how far I’ve come. Today is not day 34 of 2019, thank you very much! It’s day 764! The 1000th day is just around the corner! And now some more changes with this new year, a couple more… rules, I guess? Rules that are pushing me to get up earlier on weekdays, so I can get more done in the morning, get a nice workout in, and get to work at a reasonable hour. And they’re working, and they’re good for me. But after I took a photo early Saturday morning, and again the following Saturday, even earlier, I realised this was totally not sustainable and I was probably going overboard. I think deep down I worried that if I slipped once with my Sunset Beach project, I’d drop the whole thing and never pick it up again. But as the Good Book says, non sum qualis eram, so I let myself break the pattern last Sunday and my gawd what a relief that was. I could allow myself to sleep in again! And everything turned out fine because I was up bright and early Monday morning. The lesson for me is: remember what the rules are for. And remember that nothing’s set in stone; if they don’t work, I can just change them. I have the power, not just to choose the terms of this challenge, but to follow through with those decisions. There were a few days when it was nothing but Sunset Beach. But then I got THE MOTHER OF ALL SUNRISES—made me late to the gym but I knew I couldn’t let this beauty go—and the next day I went on a little walk into Gastown. It’s been a while since I did that, and it felt nice. The world isn’t all sunrises and beaches, it’s also gritty urban stuff. 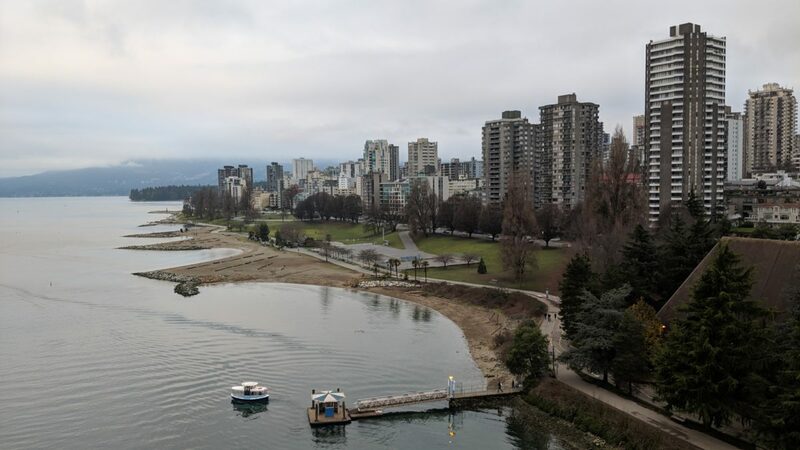 And though I felt a bit under the weather, and the weather itself turned colder, I took a little walk on the Seawall and enjoyed terrible movies. And slept it again. It snowed on and off today. Tomorrow, I’ll be up again ere break of day to see how much snow is left on Sunset Beach, that should be fun.